A Saudi teen who arrived in Canada Saturday after fleeing her family says she needed to risk her life in order to live freely and be independent. And she feels that since arriving in Canada, she has been born again. A Saudi teen who arrived in Canada Saturday after fleeing her family says she needed to risk her life in order to live freely and be independent, and is very happy to be in Canada. "I felt that I was reborn, especially when I felt the love and the welcome." Rahaf Mohammed al-Qunun, 18, told the CBC's Susan Ormiston in an interview on Monday that she never thought there was even a one per cent chance that she would be able to come to Canada, or that people would be talking about her story around the world. Mohammed — she has dropped "al-Qunun" from her name because her family has disowned her — claims she was physically and mentally abused by her family since she was 16 years old, and that she thought about escaping for years. "I was exposed to physical violence, persecution, oppression, threats to be killed. I was locked in for six months," she said, in Arabic, describing what happened after she cut her hair. When she turned 18 she felt able to try to escape, she said, because she would be treated as an adult around the world, and that she would be able to make her own decisions. She knew a family vacation to Kuwait in early January was her chance. "From a while ago I was trying to convince my parents to go to Kuwait because as long as I'm in Saudi Arabia, I cannot leave. But once I'm in another country I can travel and it's allowed," she said. 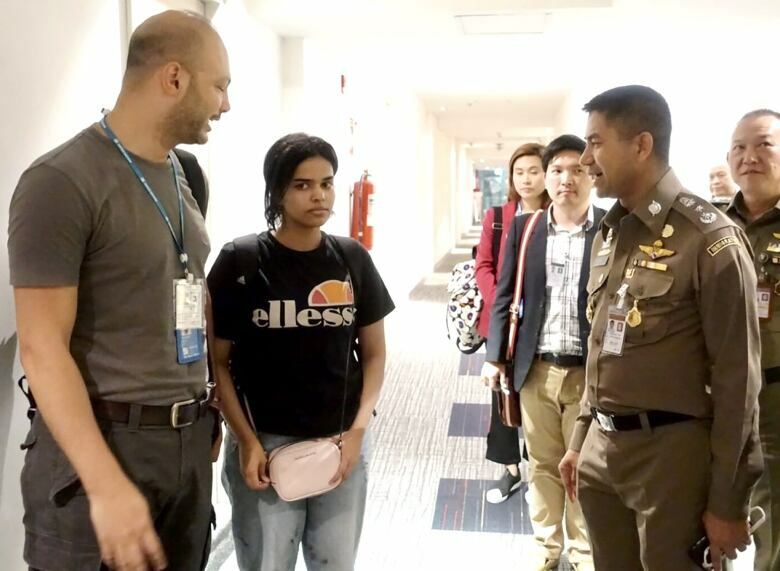 Mohammed said she waited until her family went to sleep early one night, the very last day of their trip, and then bought her ticket to Thailand and left the hotel room at 7 a.m. But she was stopped at the airport in Bangkok. Mohammed was denied entry and had her passport seized. With the threat of being sent back to her family, she barricaded herself in a hotel room and used Twitter to plea for help. "My greatest fear," she said, "was if they [my family] find me, I would disappear and I wouldn't know what would happen to me after that." She even wrote a letter to her friends, because she says she was prepared to end her life in the hotel room before she would let herself be taken. "I wrote it and I sent it to my female friends, should I disappear they would publish it to the whole world." Her tweets and her case drew international attention, and Thai officials eventually agreed to let her stay in Bangkok under the protection of United Nations officials. Mohammed said when the UN officials showed up at her hotel, she didn't believe at first that it was true, that her pleas had been heard. She feared the Thai and Kuwaiti authorities "would lie and pose as the UN, so I wanted some sort of proof that they are actually the UN. "So they showed me the proof. After that, I opened the door and I welcomed them," she said, smiling at the memory. Still, as happy as she is to be free, to be in Canada (despite the cold, she said), Mohammed is clearly upset that it has meant losing her family. She said she received a message from them, telling her she was disobedient and now disowned. She started to cry during the interview, saying she didn't expect that. She said she is very sad, so sad that she can't even talk about it. Saudi Arabia ranks among the worst countries for women's rights and equality. The World Economic Forum ranked it 141 out of 149 in its 2018 report on gender equality. Mohammed said she endured daily oppression and violence from her mother and brother. Her father, she said, did not live with the family, but still exerted control over her in terms of what she could study and where she could work. She has been accused of not telling the truth — that things aren't as bad in Saudi Arabia as she says. She rejects that. "These people, maybe their families are more understanding and they don't know the real life. But there are a lot of women imprisoned and there are a lot of stories that they can read to know the situation of women." She calls herself an example of how bad it can be. "Why would I escape from this life if the conditions were good?" Now that she is in Canada, Mohammed feels safer. Not 100 per cent, she said, because everyone knows her now and knows where she is. Still, she is looking forward to continuing her education, exploring, learning English and living a normal life. She also wants to continue to be a voice for the women still in Saudi Arabia, but she also hopes that they will fight for changes themselves. She said she knows many women who have fled Saudi Arabia, but added she wouldn't encourage women to do it, as they would be putting their lives at risk. She wants them to fight. But if nothing changes, she added, "escape."